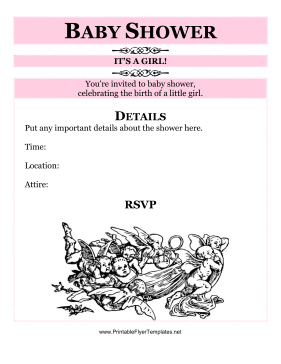 This charming pink baby shower flyer includes ornate details and attractive candy-striped borders. It also has a picture of a little girl being stolen by fairies, because she was just too sweet! You can put details about your shower on the flyer, including the time and location. This flyer is perfect for advertising a work baby shower, or it can be folded and sent out to guests.